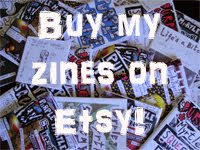 Purple Myrtle Squeegy: Issue 4 - 24 Hour Zine Thing! Issue 4 - 24 Hour Zine Thing! Issue number 4 of Purple Myrtle Squeegy is published. I made this issue as part of the 24 Hour Zine Thing challenge. So the zine was made in 24 consecutive hours, from start to finish. For more details on this experience, visit my blog! The topics are spontaneous, and the layout is unique and funky. I had an awesome time doing it and will probably do it again next year. The issue is now up for trade as are all the other issues of the PMS Perzine. Here are some sample pics!